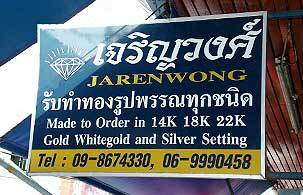 Jarenwong, jewelry and ornament factory offers made to order service with many designs of gold ornament in 14K 18K 22K, silver setting, platinum, gems stone, diamond, pearl and restore service by our professional craftsmanship in every process. Moreover, Jarenwong can arrange delivery service for you both in Thailand and foreign country. Visit us at Jarenwong, jewelry and ornament factory … to see all gold ornament and other in different designs, then you will touch a beauty of ornament which created and designed by yourself. ***Our product is guaranteed by Quality Certificate.